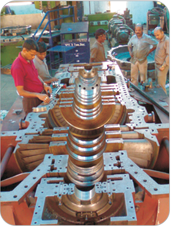 We at Kessels source our Gearboxes duly tested from world renowned manufacture rs. Offering both single and double helical gearboxes with API specifications depending on the customer’s preference, Kessels provides these Gearboxes with adequate service factors built into their design. Kessels studiously avoids the temptation of procuring individual componentsand assembling them in-house to save cost, instead leaving the manufacturing, assembly and testing to the professionals. The blades used in Kessels Steam Turbines are designed with a high factor of safety and possess special aerodynamic profiles that provide for maximum heat drop across the stages, resulting in higher generated power. With over 300 different combinations incorporating different metallurgies such as chromium stainless steel alloy and titanium to suit different applications, Kessels is one of the few Steam Turbine manufacturers in the World to actively integrate and use long blades with tapered and twisted profiles for the last few stages, achieving optimal operating efficiency. Kessels blades are specially treated to prevent edge erosion, ensuring a long operating life, and tested and examined by the Zyglo method for crack detection before use. Kessels gets its Rotors machined from a solid alloy forging of a specific metallurgy. These rotors are forged under a strict control on the grain size, the entire manufacturing process and with an adequate reduction ratio.The machining at different stages is done on Conventional and CNC machines to ensure high precision and utmost quality. The trademark of Kessels turbines across different power ranges is the application and use of rotors with a large journal diameter. Large diameter rotors increase the torque carrying capacity, and are significantly safer in operation under varying steam conditions. Kessels stresses upon stringent quality checks and tests throughout the process of forging,to the final machined rotor. Quality control checks include the test of Physical and Chemical properties, Hardenability test, an Ultrasonic examination and dye penetrant examination after finished machining. To ensure minimal vibration, the finished bladed and shrouded rotors are dynamically balanced at varying speeds. Kessels Casings are rugged and heavy across the entire range, designed with contoured walls and robust flanges to achieve rapid conduction of heat and prevent large temperature gradients. These measures are undertaken to ensure a safe and long operational life. These casings are cast at some of the best and leading foundries, and further machined in-house in one of the three Kessels workshops spread across India. From the process of casting to getting machined, these casings undergo continual quality checks such as Chemical analysis, Physical property tests, magnaflux examinations and dye penetrant checks on machined surfaces, and ultimately hydraulic testing at minimum 1.5 times the working pressure. In addition to the above, Kessels leading practice of controlled stress relieving after each critical stage of casting and rough machining ensures its casings are the safest, and of the highest standards possible in the World. Kessels Multistage Turbines have a Quick Acting, hydraulically operated Trip and Throttle valve as standard. These special action fully automatic valves provide an extra dimension to the safety of operation of the turbine by closing itself in microseconds in a case of emergency, thereby avoiding any possible damage. The Diaphragms, housing the Nozzles are center key supportedin the casings, avoiding any misalignments,beingsafe and extremely user friendly. The design of Nozzles is a critical parameter in the overall working and the efficiency of a Steam Turbine. These Nozzles are specially fitted and welded into the diaphragms, with the utmost care taken to ensure complete sealing and to avoid steam leakage and eventual energy loss. These specially designed and fitted Diaphragms, together with a wide variety of Nozzle designs to suit the steam conditions and power requirements make Kessels Steam Turbines one of the most efficient in the World. Kessels sources its Condensers from some of the leading manufacturers in India. These Shell and Tube type surface condensers are designed as per best practices and according to the latest HEI and ASME specifications and standards.Rigorous quality practices and the use of adequately sized tubes ensure the condensers supplied with Kessels Turbines have just as long an operating life. Through years of experience and continued R&D by Kessels, the most reliable, user friendly and maintenance free method of inter-stage and end steam sealing for Turbines have been found to be the use of Carbon Rings, Labyrinth Seals and Sealing Fins. Kessels offers all the three options in its varied range of Steam Turbines. 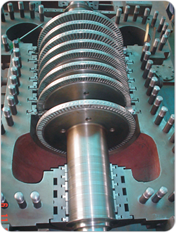 Kessels Single Stage Turbines use special carbon ring packing for mechanical sealing of the steam for their ease of use and in-situ replacement. Thespecially designed Labyrinth seals are machined from special grade stainless steel, are of spring backed type and placed between the rotor and the casing to prevent and minimize steam leakage. Under normal operating circumstances, these labyrinth seals do not contact the rotorand do not warrant any maintenance for an extended period of time. 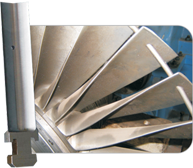 The larger Multistage Turbines from Kessels use J-Type sealing fins for mechanical sealing and preventing steam leakage. J-Type sealing fins are significantly safer than regular seals, being easily replaceable and limiting the damage to the rotor by rubbing in the event of an accidental run-away.